Voltaire is the nom de plume of Francois-Marie Arouet, a well-known writer, philosopher, and historian from the Enlightenment period. 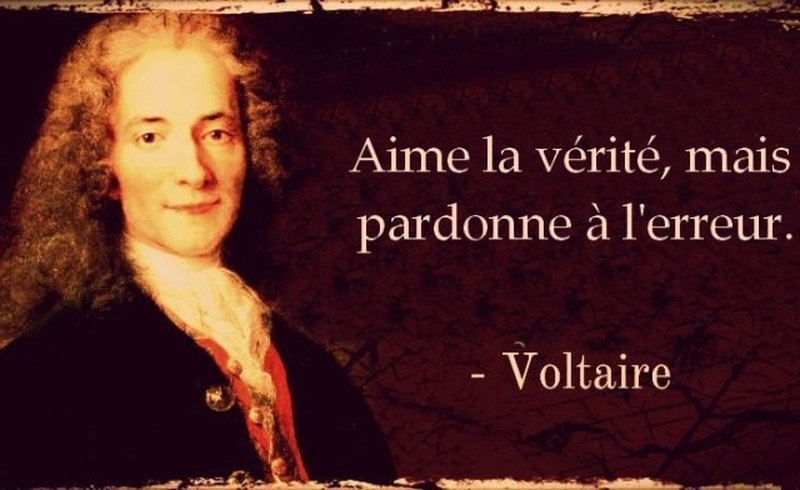 Born on November 21, 1694 and died on May 30, 1778, Voltaire had an excellent wit and was known for advocating separating church from state as well as freedom of expression and freedom of religion in addition to his various attacks on the Catholic Church. As a versatile writer, he has written in many different literary forms like scientific and historical works, essays, novels, poems, plays, etc. Add to these, he ever wrote over 20,000 letters and 2,000 pamphlets and books. No wonder there are so many Voltaire quotes have survived the test of time. As a versatile man, you can find Voltaire quotes about a wide range of subjects, including general advice on life, love, work, wisdom, religion and so on. It is hard to show all the wisdom and ideas about Voltaire in these 30 quotes. Here, I just list some of my favorite. You can tell me your favorite ones. Let's share with each other. A single part of physics occupies the lives of many men, and often leaves them dying in uncertainty. When we hear news, we should always wait for the sacrament of confirmation. Men will always be mad, and those who think they can cure them are the maddest of all. Wishes and woulders be small householders. Despite the enormous quantity of books, how few people read! And if one read profitably, one would see the deplorable follies to which the common people offer themselves as prey every day. Men who are occupied in the restoration of health to other men, by the joint exertion of skill and humanity, are above all the great of the earth. They even partake of divinity, since to preserve and renew is almost as noble as to create. The flowery style is not unsuitable to public speeches or addresses, which amount only to compliment. The lighter beauties are in their place when there is nothing more solid to say; but the flowery style out to be banished from pleading, a sermon, or a didactic work. I have had some knowledge of love myself, this sovereign of hearts, this soul of souls; yet it never cost me more than a kiss and twenty kicks on the backside. But how could this beautiful cause produce in you so hideous an effect? It is one of the superstitions of mankind to have imagined that virginity could be a virtue. There are therefore spheres in which the moderns are far superior to the ancients, and others, very few in number, in which we are their inferiors. Atheism is the vice of a few intelligent persons, and superstition is the vice of fools. Real authors are those who have succeeded in one of the real arts, in epic poetry, in tragedy or comedy, in history or philosophy, who have taught men or charmed them. The others of whom we have spoken are, among men of letters, what wasps are among birds. Virtuous men alone possess friends. Liberty then is only and can be only the power to do what one will. That is what philosophy teaches us. But if one considers liberty in the theological sense, it is a matter so sublime that profane eyes dare not raise themselves in it. There are some that only employ words for the purpose of disguising their thoughts. Server responsed at: 04/25/2019 2:03 a.m.